THIS IS A VERY EXQUISITE 3-D CUFF BRACELET THAT MUST NOT BE OVERLOOKED!!! Sterling Silver, Turquoise, Magenta Turquoise, Mojave Turquoise, Red Oyster Shell, Picture Rock, Opal, Black Jade, Yellow and White Mother of Pearl. The inner bracelet circumference measures approximately 5-1/2", plus a 1" opening, and 1-1/4" at widest point. The bracelet weighs 56 grams. 3-D cuff bracelets are stunning pieces of wearable art! 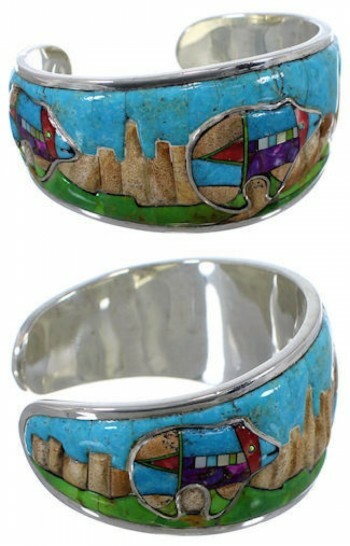 The bracelet is a marvelous piece of jewelry that is hand crafted out of genuine sterling silver and multicolor inlay. The inlay consists of: real Turquoise, Magenta Turquoise, Mojave Turquoise, Yellow and White Mother of Pearl, Red Oyster Shell, Picture Rock, Black Jade, along with man made Opal. The inlay is delicately placed while creating an impressive 3-D design of three bears amidst a landscape of mountains and a brilliant blue sky! Incredible inlay patterns can be seen creating an excellent arrow design on the Bears, accenting for a wonderful finish. In some beliefs the bear symbolizes physical strength, leadership and is known as the "first helper". Arrows usually signify direction of travel, force and movement. The bracelet is stamped sterling and hallmarked.